The Vienna 12-T is a multipattern FET condenser microphone. It is part of the 2013 set of five “T-Fet” tripolar microphones from ADK’s “Custom Shop” product line. The capsule is called the GK12. It is designed to reproduce the sound of AKG’s C12 microphone. Note: it is not a clone of the CK12 capsule, but rather a sonic clone of the CK12 when heard within an early C12 microphone. 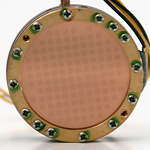 The mic uses premium parts throughout, including Wima film capacitors, an uncommon JFET, and an output transformer form Oxford (OEP). The mic has three switches in the ring below the headbasket. The switch on the mic’s front allows selection of any of three polar patterns: Cardioid, Omni, Figure-8. The mic’s sensitivity changes slightly from one pattern to the next, but ADK has not published specifications to this level of detail. Two more 3-position switches on the rear of the mic control the pad and filter options, independently. The pad can be set to 8dB or 16dB of attenuation. The high-pass filter is a 6dB/octave slope, with a -3dB point at either 100Hz or 160Hz. All the Custom Shop FET mics ship with a foam windscreen, elastic shockmount, gooseneck pop/blast filter, soft storage pouch for the mic, and a padded, compact suitcase. The predecessor to the Vienna 12-T was the Vienna 12 Au, also known as the Vienna II Au; this was a fixed Cardioid mic that was otherwise very similar to the 12-T. The Vienna II-AU excelled on drum overheads, upright bass and piano. It also worked well on clean electric guitar. I used the mics in a spaced pair fashion on drum overheads with the pads on both mics set at 8 dB and I had wonderful results.